Very small devices aren’t always the best options for everyone, especially if you have any hand dexterity issues. The Neosonic Hearing Amplifier Mini RIC is another competitor to the Empower (formerly Lifeear) and the Otofonix Digital Hearing Amplifier. I’m actually pretty excited about this model as it has very similar (or perhaps slightly better) features to its competitors. It claims to be the smallest amplifier on the market right now, and have the most sound gain out of the three options in this price range. The other big difference is that it has the receiver in the canal, which usually means better sound quality, (less whistling). This model is recommended for mild to moderate-severe hearing loss. It comes with a one year warranty and a 45-day money back guarantee. Neosonic is a relatively new company that is currently offering four different hearing amplifiers, with the Neosonic Hearing Amplifier Mini RIC having the most advanced sound processing technology of the four models that they sell. 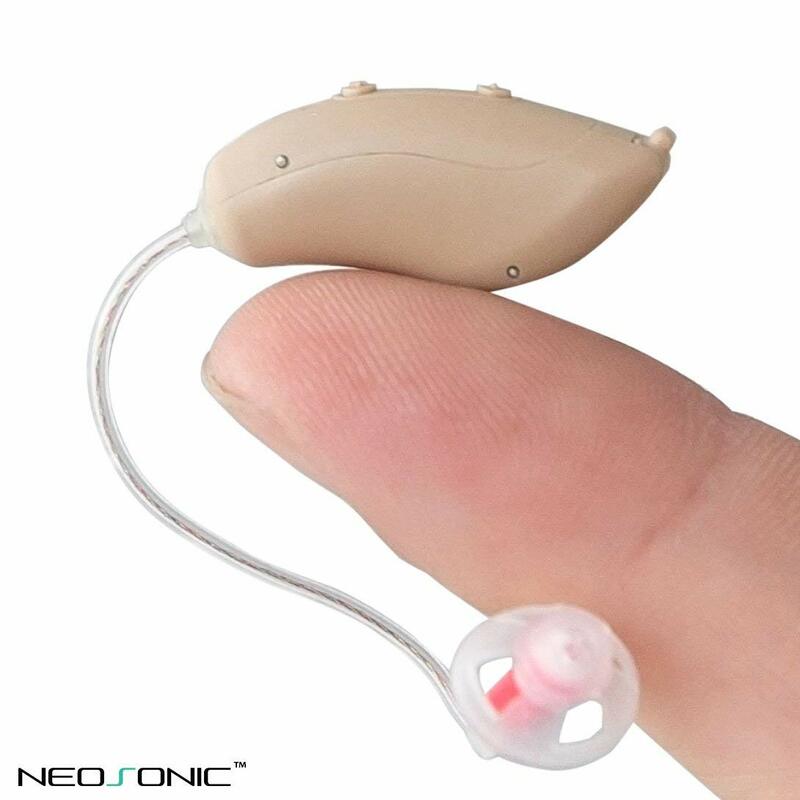 Neosonic Hearing Amplifier Mini RIC is very small, so it should be a comfortable fit for the average user. Usually with hearing amplifiers the smaller, the better since it will be nice and light. 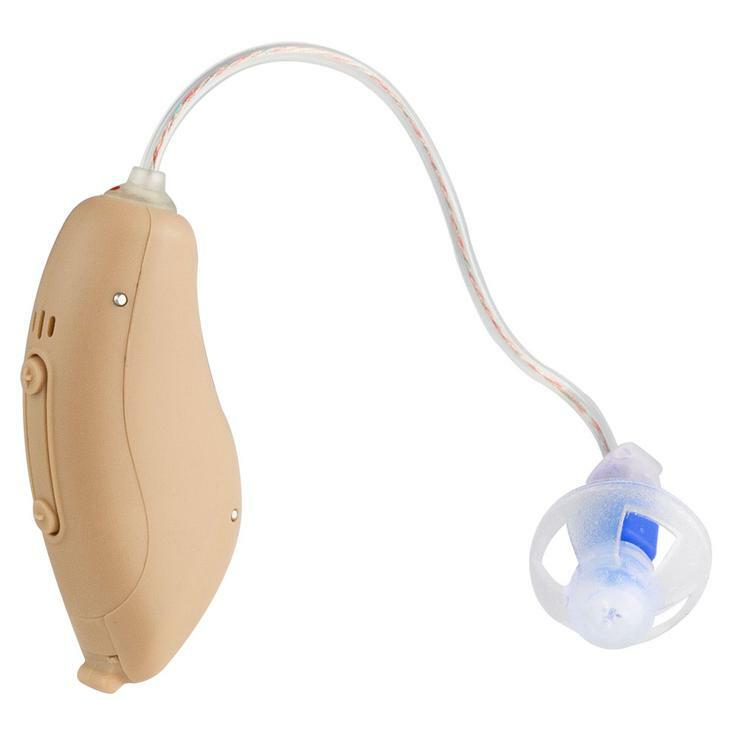 Reviews of this device report that the ear dome stays in place quite well, although some users find the tube from the unit to the dome a little short. It comes with 5 domes in the package; 3 are open domes in small, medium, large sizes and the other 2 are double layered close domes. It is excellent that this amplifier comes with such a large selection of domes since it will allow you to test out what works best and is most comfortable for you. Generally, open domes tend to be a little more comfortable to wear since you can hear some of the natural sounds that go through the piece. While closed domes usually mean that you get better hearing performance, although everyone is different, so you have to use trial and error to work out what you like best. The Neosonic Hearing Amplifier Mini RIC comes with a 12-month warranty as well as a 45-day money-back guarantee. They promise a no-hassle return process and will even pay the return shipping costs. The Neosonic Hearing Amplifier Mini RIC takes a size 10 zinc air hearing aid battery that can be purchased quite easily online or at places like Walmart. The battery life is approximately 5 days. There is no on/off button, and so you have to open the battery door at night to make sure you prolong the life of the battery. It is relatively common on this type of product and can be a pain, especially since the unit is so small. If you do have difficulty handling small items, you may want to avoid this unit for that reason. Reviews report that the help and support from Neosonic are excellent. They are easy to get in touch with and are very helpful, responsive, and professional when dealing with issues that may arise. Customers who have returned devices found the process to be quick and easy. You can contact Neosonic through their website, by email or by phone. Similar to its competitors, The Neosonic Hearing Amplifier Mini RIC has 4 pre-programmed amplification options that are suitable for the most typical hearing loss. You change the program based on the situation you are in. The programs are normal, outdoor, noisy, and meeting. You will have to spend a bit of time experimenting with the modes and volume levels until you find the combination that gives you the best results in various situations. The Neosonic Hearing Amplifier Mini RIC is a great, new option in the growing good quality hearing amplifier market that is bringing some of the technology of high-end hearing aids to those with hearing loss at much more reasonable prices. It is still quite a new product, but the reviews for the Neosonic Hearing Amplifier Mini RIC are very positive for both the quality of the device, as well as the customer support and service that you get from Neosonic.